This record is arguably one of the most anticipated releases within the doom scene this year. Scott ‘Wino’ Weinrich’s extensive musical resumé (Saint Vitus, Spirit Caravan, The Obsessed, etc.) 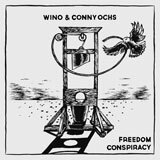 automatically launches it into the spotlight, however, Wino’s previous release with German folk artist Conny Ochs (Heavy Kingdom) are enough of an assurance that this newest collaboration is going to rule even without the notoriety of Wino himself. Both Wino and Conny’s vocals are blue prints of how country songs should be sang and, when paired together, create a harmonious union where the only fitting description seems to be “folk-doom”. Freedom Conspiracy is the second album these guys have put out, and is much the same as their debut; stripped back, hopeless, and emotive acoustic numbers that seem like they’re written especially for the lost souls and tortured artists of the world. There is a power in this simplicity, however, and much of the feeling and story would be lost or ruined with the addition of unnecessary percussion or electric guitars. The subject matter touched upon on this record is much more personal than anything sang about on Heavy Kingdom though, and it seems like both Wino and Conny are projecting from a place that’s dark and full of hurt. Opening track Drain is uncomfortably honest, and Wino comes across as pensive and self-reflective in his vocal assertions, singing “hold on blue sky, it’s over when your dreams die”. It’s impossible not to be moved by how poignant the simplicity of his delivery is. Both artists are laying themselves bare for the world to see, scars and all. The songs that follow tell tales of lost love, regret, world weariness, self-destruction and addiction. In spite of the gloomy nature of the subject matter, it’s uplifting to know that both artists have become comfortable enough with each other to use this project to exorcise their respective demons. With nothing but acoustic guitars to fall back on, Wino and Conny are solely reliant on each other’s voices to carry them through this sorrowful tale; this works in their favour, however, as their harmonies lift one another to the forefront each one’s voice complimenting the other. Both singers possess a rich and powerful voice which will make you feel every bit of the tales they have to tell. There’s a lot riding on this release and, for those with high expectations, you won’t be disappointed. This is much darker than their previous efforts and, despite being an acoustic record, is mind numbingly heavy purely for the authenticity of the sad realities and harsh truths revealed within the lyrics.